SOX-10 is a member of the SOX (SRY-related HMG-box) family of transcription factors involved in the regulation of embryonic development and in the determination of the cell fate. SOX-10 is predominantly found in oligodendrocytes, peripheral glial cells, melanocytes and adult neural crest stem cell populations. SOX-10 is up-regulated in melanoma, glioma, schwannoma, neurofibroma, pheochromocytoma, and lung carcinoid tumor. 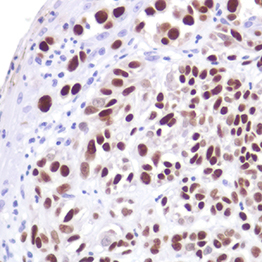 Spring Bioscience develops rabbit monoclonal antibodies engineered for use in immunohistochemistry (IHC). 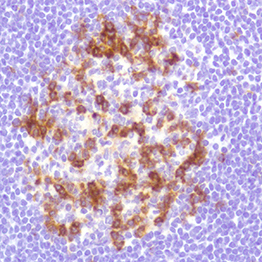 Founded by scientists with a primary focus on IHC, Spring has developed a proprietary menu of highly-sensitive Spring Proprietary (“SP”) antibody clones that yield exceptional specificity and consistency in research. Spring Bioscience was acquired by Ventana Medical Systems, Inc., a member of the Roche Group, in 2007 and serves as an antibody center of excellence for Roche with strong pharmaceutical partnerships across the industry.